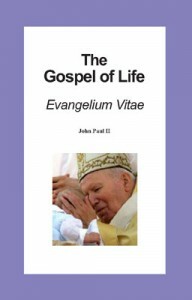 In this book, St. John Paul II shares his profound wisdom and practical insights on the importance of human life and how best to defend it against the many attacks of the present day. This is a short book, but packed with what we need to make an effective stand for life. The pope (and saint) explains how to replace a culture of using people with a culture based on love, and points out that contraception and abortion are fruits from the same tree. This entry was posted on Tuesday, March 17th, 2015 at 4:44 pm	and is filed under Uncategorized. You can follow any responses to this entry through the RSS 2.0 feed. You can skip to the end and leave a response. Pinging is currently not allowed.